This event was held twice to mark International Plain Language Day in 2014 and 2015. It also served to further a conversation started in 2013 at the Vancouver Conference of the Plain Language Association International. Today (2018) we clearly see the convergence of various approaches to fulfil a communication need. We see a convergence of techniques and assorted professions working together to pursue media relations, public relations, social media, and content for the different communication channels All of these incorporate visual content. Getting bored with all these lists? 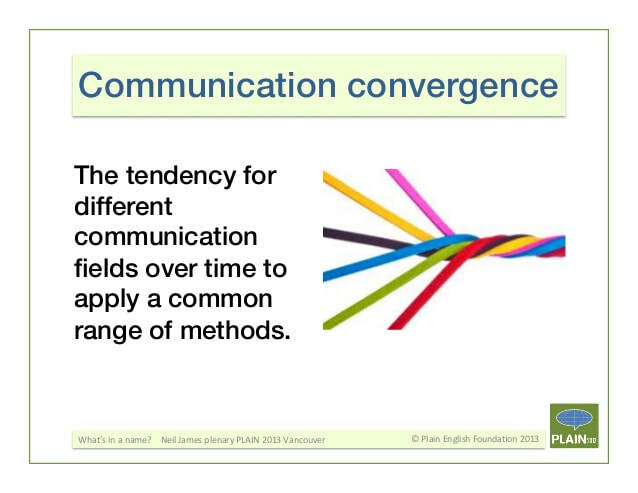 Since we are all aiming for clarity, shouldn’t it be simpler to describe the field of communications. What does the modern world demand of communicators? The entire field of communication is undergoing rapid change while we are figuring this out what skills or specialties we need. Journalism is changing. Media are evolving or emerging. The field is changing and areas of practice are converging. Communicators must know how to reach, engage and motivate their target audiences. Writers must stop living in mortal fear of public speaking. We need to network outside our comfort zones to create new and deeper relationships with communications professionals of all ages and disciplines. To Stay Relevant How Do Communications Professionals Need To Evolve?